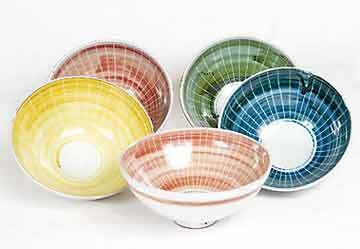 Caiger-Smith Repeat Ware bowls - 5½" (139 mm) diameter. 1960. Alan Caiger-Smith was born in Buenos Aires in 1930. He studied at Camberwell School of Art, the Central School of Art and Cambridge University where he read history. He is best known for his tin-glaze work. With Geoffrey Eastop he founded Aldermaston Pottery in Berkshire in 1955 and has written extensively on the subject of tin-glaze pottery and lustre decoration. The Aldermaston Pottery was founded in Berkshire in 1955 by Alan Caiger-Smith and Geoffrey Eastop, and over the years the studio has been home to many fine potters. The potters at Aldermaston, who number about half-a-dozen, work both as a team, for production work, and individually, for studio pieces. The Pottery is noted mainly for its tin-glaze wares, but also produces porcelain. Are you a club secretary?